This week seemed to fly by! We had lots of special visitors for Fire Safety Week, including our local Fire Department, Smokey the Bear and Pluggie the Fire Hydrant (American Red Cross). We also had Professional Development training day on Friday, so we've been very busy. My co-workers and I have been working on the next three weeks worth of lessons to help get us through the end of October and beginning of November. I am loving having two hours a week of plan time with my fellow Kindergarten teachers. 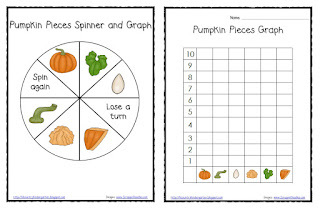 While I was thinking about what to do for our Pumpkins unit, I came up with a song for Science to help teach students the parts of the pumpkin. However, I didn't have any cutesy graphics to go with it. So, I contacted Denyse at Scrappin' Doodles with my song and asked if she could make some graphics to go with it. I got an email from her that she was finished today and the graphics were absolutely PERFECT for what I was needing! Be sure to check out all of Denyse's cute designs at www.ScrappinDoodles.com. 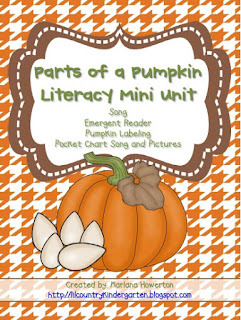 Then, Parts of a Pumpkin Literacy Mini Unit was born! I also added to the unit an emergent reader, a labeling worksheet and the song in pocket chart form with pictures. Feel free to check it out in my TpT store by clicking the picture below. It is only $3. Click on the picture below to download your freebie! I hope you like it! You rock! We dive into pumpkins this week; thanks for sharing!